I am 23 years old male and have disastrous history of eczema since childhood. 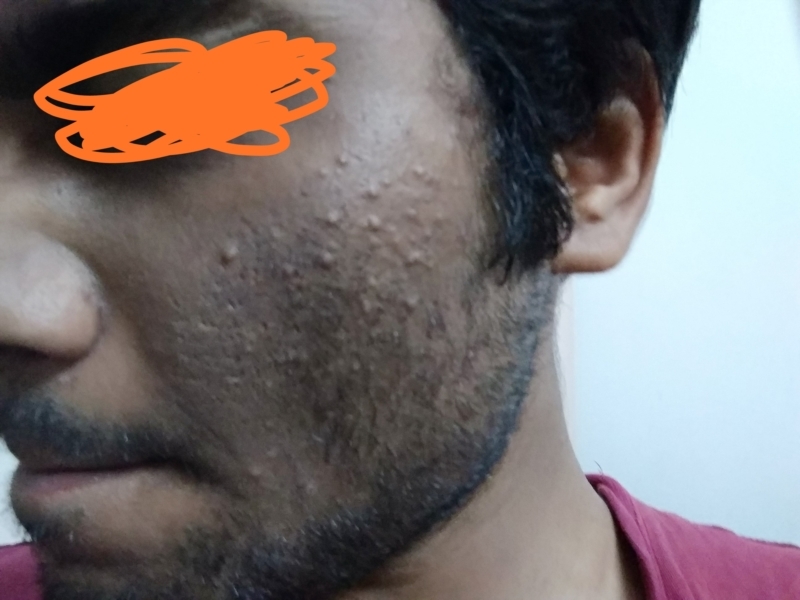 6 years ago i started having acne on face and i visited a dermatologist which gave some medicines which caused me to develop big scars on face which used to get swollen up and yellow liquid used to ooze out of them and it felt very itchy every time i used to fell like scratching them. I consulted many dermatologist in my city and each first used to provide steroids medicines (for some time like 2 weeks) to reduce the the swelling and the oozing along with some moisturiser. They worked pretty good only till i was taking steroid medicines after that the problem kept reoccurring and each time it reoccurred it covered and spread over more area. This continued for like 3 years till i decided it was enough and then i discontinued the medical treatment started using almond oil on my face which reduced the itching quite well and also reduced the swelling and oozing of the yellow liquid. But the problem is that my face skin have darkened in these years quite a lot and whenever i try to use anything to reduce the darkness like hydroquinone or any other medicines even the sun screen my eczema starts again i have attached the present condition of face. The color of face is much more dark than my legs or my hands. One thing i noticed was when i was using steroid for treating the eczema they also were improving my skin tone and getting it even. I steroid can improve my skin color I would like to continue the steroid medicine because i seriously think nothing here is helping me. And what can be possible problems that long term use of steroids can cause. I really don't think anything is working I heard that you shouldn't use steroid for long peroid but I dont think anything else is working. Hello, Can you tell me if the steroids can help to equalize my color of face as you can notice the difference in the nose and cheeks skintone. And also whether i should take oral or some ointment steroids and can they trigger acne on my face. i have been concerned that I have been taking Prednisone over 2 years now and see that you have been taking it for 40 years. Do you have issues with your bones? Or any other health issues from Prednisone? Have you been on low dose.? I am down to 3 mg a day and take Allegra. I have Chronic Urticaria and the Prednisone. With Allegra is the only thing that gives me quality of life. My doctor had me go down on Prednisone 1 mg at a time and stayed on that dose for a few weeks before going down another 1mg. I hope I can go into remission but if not I may have to stay on Prednisone. I look forward to hearing from you. Don’t take steroids unless prescribed. Ask Dr. About OTC steroid creams and prescription ones . Use only a tiny amount . As to dark scars, there are OTC prducts that may help. Your face is tender and will react to almost anything . Treat it gently. Use mild cleansers and very lite moisturizers in the dry places.